Attendees (description) of the October 12 Veggie Call: Craig Mauney (Extension Area Specialized Agent), Inga Meadows (Extension Associate, Vegetable and Herbaceous Ornamental Pathology), Lisa Rayburn (Extension Agent, Onslow County), and Amanda Strayer-Scherer (Postdoctoral Research Scholar, Plant Pathology). Vegetable Production Updates: REMINDER: October 12 was the last Veggie Call of the 2018 season. Overall, there was not a lot to report in this Veggie Call. There are some reports of pest problems on Kale and other cooler greens. Pythium has been a problem for organic kale producers in Western North Carolina. The pathogen can be managed by reducing standing water and using products such as Serenade Soil and Trichoderma products. However, these products only work well when disease pressure is low. N.C.Department of Agriculture & Consumer Services announced a quarantine on Tobacco and Field crops in North Carolina due to impacts from Guava Root Knot Nematodes. Bacterial Spot or Bacterial Speck symptoms on field tomatoes in Western North Carolina. C. N.C. Cooperative Extension Conference November 14 to November 16, 2018. This is an NC State University employee development conference for extension agents, county extension directors, specialists/extension associates, and administrators. For more information, see the event page. Bacterial Speck is caused by Pseudomonas syringae pv. tomato and is prevalent worldwide. The disease is favored by cool temperatures and high moisture conditions. Fruit spots reduce the marketable yield of fresh-market tomatoes, but lesions are superficial and moderate spotting can be tolerated in canning tomatoes. Symptoms: Leaf lesions are often difficult to differentiate from other foliar tomato diseases such as bacterial spot and early blight. Leaf lesions are small, black spots that are typically surrounded by a yellow halo. Fruit lesions are superficial spots that dark brown to black in color. Signs: On leaflets, bacterial speck can be easily confused with the early symptoms of bacterial spot, early blight, gray leaf spot, target spot, or Septoria leaf spot. When Pseudomonas is present, bacteria will ooze (also referred to as bacterial streaming) from infected tissue and can be observed under a light microscope. Bacterial streaming will not be observed in lesions caused by fungal pathogens. In terms of differentiating bacterial speck from bacterial spot, the bacteria must be isolated in a laboratory capable of differentiating the two. However, the management strategies are the same for both diseases. Management: Management of the disease focuses on preventive control measures throughout the season. The most effective management strategy is the use of pathogen-free certified seed and disease-free transplants. Seeds may be treated with sodium hypochlorite, hydrochloric acid, or hot water to reduce the potential for seedling infection. In transplant production greenhouses, minimize overwatering and handling of seedlings. Trays, benches, tools, and greenhouse structures should be washed and sanitized between seedlings crops. 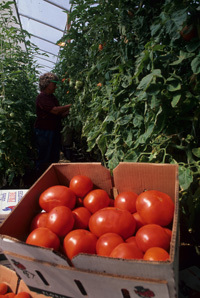 Greenhouse tomatoes can be sprayed with bacteriophages, copper-based bactericides, or streptomycin. Streptomycin CANNOT be sprayed in field tomatoes. For field tomatoes, copper in combination with mancozeb and plant activators, such as acibenzolar-S-methyl, can be used. Jones, J. B., Zitter, T. A., Momol, T. M., and Miller, S. A. (Eds.). 2014. Compendium of tomato diseases and pests(pp. 54-55). St. Paul, MN: APS press. Pernezny, K. and Zhang, S. 2017. Bacterial Speck of Tomato. University of Florida IFAS Extension. Retrieved October 19, 2018. Bacterial Spot is caused by four species of Xanthomonas (X. euvesicatoria, X. gardneri, X. perforans, and X. vesicatoria) and occurs worldwide wherever tomatoes are grown. In North Carolina, X. perforans is predominant species associated with bacterial spot on tomato. Due to diversity within the bacterial spot pathogens, the disease can occur at different temperatures and is a threat to tomato production worldwide. Disease development is favored by temperatures of 24 to 30℃ (75 to 86 ℉) and high precipitation. Bacterial spot can cause leaf and fruit spots, which causes defoliation, sun-scalded fruit, and yield loss. Symptoms: In general, spots are dark brown to black and circular on leaves and stems. However, leaf lesions are initially circular and water-soaked and young lesions may be surrounded by a faint yellow halo. Spots rarely develop to more than 3 mm in diameter. Lesions can coalesce causing a blighted appearance of leaves and a general yellowing may occur on leaves with multiple lesions. Fruit lesions begin as small, slightly raised blisters, which become dark brown, scab-like, and slightly raised lesions as thy increase in size. Signs: On leaflets, bacterial spot can be easily confused with the early symptoms of bacterial speck, early blight, gray leaf spot, target spot, or Septoria leaf spot. When Xanthomonas is present, bacteria will ooze (also referred to as bacterial streaming) from infected tissue and can be observed under a light microscope. Bacterial streaming will not be observed in lesions caused by fungal pathogens. Jones, J. B., Zitter, T. A., Momol, T. M., and Miller, S. A. (Eds.). 2014. Compendium of tomato diseases and pests(pp. 39-40). St. Paul, MN: APS press. Meadows, I., and Henson, M. 2017. Bacterial Spot of Pepper and Tomato. North Carolina State University. Plant Disease Fact Sheet. Retrieved May 16, 2018. • What's Wrong With My Tomato Plants...They Just Wilted!